Celebrate function and color with this universal cutlery block from Fiesta! 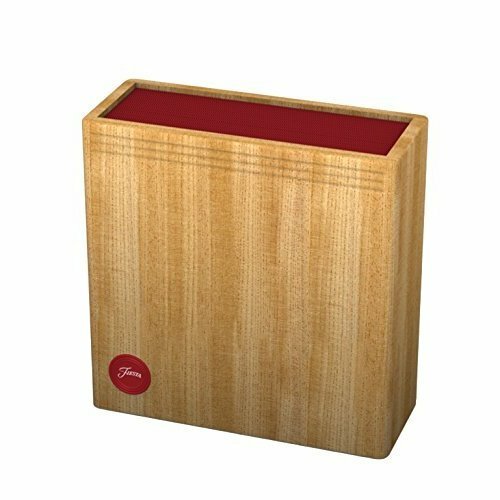 This finely crafted block with natural wood grain exterior features a colorful bristle-rod interior that is safe for use with all knives and won't dull blades. The easy to care for exterior can be cleaned with a warm, damp cloth. Always wash and dry all knives fully before sliding into the bristle block. Fits most kitchen knife sets. When I ordered this item I was unsure if it would be a good addition to my kitchen decor. But, I was pleasantly surprised how well it look and functioned. I was able to replace an older knife block that housed my German knives. I have a collection of Japanese knives that are displayed on a magnetic block because of their beauty. By using this new block, now my German knives look much nicer and part of a collection rather than drab. Good decision! I love the size and the capacity. It fits snugly against my counter, is out of the way and handy.